Take him wherever you go. Super Mario 3D Land is one of the most anticipated games of the year, but if you haven't yet got your pre-order down then GameStop is hoping to change that pretty quickly. The retailer is offering an exclusive Tanooki Mario keychain when you pre-order and buy the game, either in-store or online. There's no image of it yet, but we suspect you can rustle up a mental image of what a Tanooki Mario keychain might look like. Pre-order your Super Mario 3D Land with keychain, and come back later in the week for our in-depth hands-on preview of Mario's upcoming 3D escapades. Cool for people who pre-order at Gamestop. Also: Nice artwork! I haven't even finished Super Mario Galaxy yet, but I know I'll just plough through this. Will we be getting this if we preordered the game before this was announced? Pretty sure this is a stupid question but I just want to be 100% sure. Well that pretty much confirms a Gamestop pre-order for me since I'm a key-chain collector. Though, if GAME does this too I'll pre-order it there. I'd really consider a preorder if they did the same thing here. Still a matter of how good the keychain really looks and if the game is much cheaper somewhere else. Yes I definitely want this Divine Keychain to hang in my room! GameStop offering a Tanooki Mario keychain = The Snake offering Eve a nice juicy apple. @Kage_88: Gamestop's not the devil! Speaking of apples, I haven't had a good Caramel Appletini from AppleBees in a while. Should I take out my fiance, or my new copy of Mario 3D Land 3DS? Now that's a temptation, LOL! i checked the U.K gamestop site and you can pre-order super mario 3DS for £29.97, but sadly, they don't seem to have the keychains. shame really for us brits. the keychain must look pretty cool though. Its seems like Gamestop is really going the extra mile to get pre-orders on this game. Not only are they doing this, but offering double reward points for all members who pay off their pre-order by Oct. 16. I was eventually going to pre-order Mario 3D Land at GameStop anyway now I will make sure to pre-order the game the next time I go to GameStop. Sweet! My copy's been pre-ordered for like three weeks now. Does EB Games Canada count? Bleh! Mario and Zelda within one week of each other? Well I know where I am pre-ordering my copy from! The picture is up now. Finally I get something for preordering a Nintendo game! Whoo hoo! The last thing I got was the Metroid Other M Art Folio which is still displayed on my entertainment center. I want to see an actual picture of the keychain instead of a picture of Tanooki Mario with a metal ring pasted on top. Going to be heading to Gamestop on the 3rd to pre-order this! 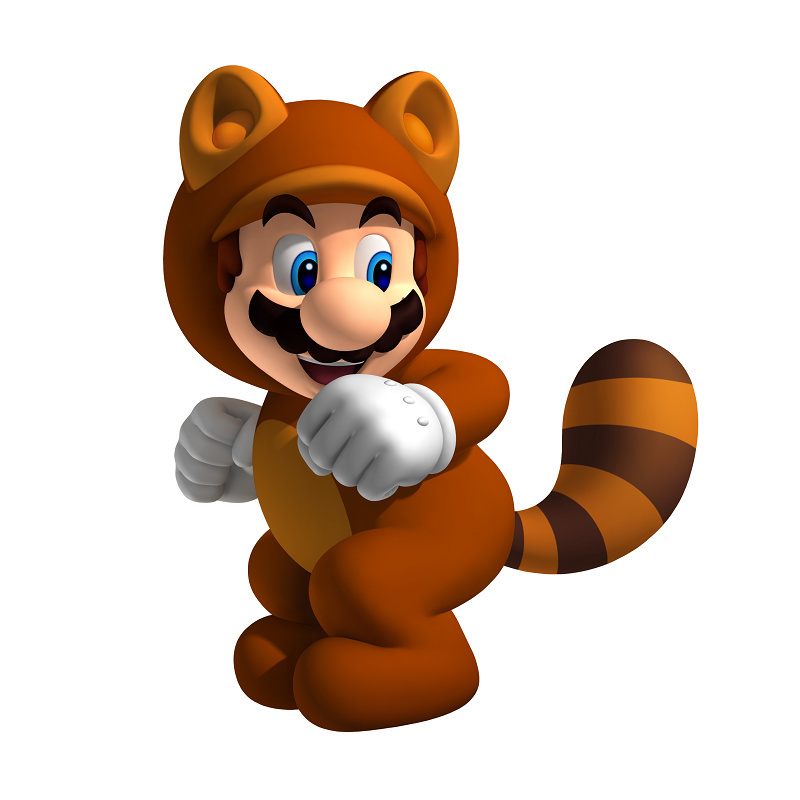 Me wants my own tanooki suit! Nice and warm for cold weather coming up! And I can turn to stone, so undesirables like work bosses will pass me without even noticing I'm there! If it's just a flat one i'd prefer a sticker set since i only display these things at home. Still doubt that we'll get any preorder bonus in Germany though. I pre-ordered Super Mario 3D Land back in March. I just hope that I can get one of these. This is totally WICKED! I'm ready to go pre-order now! Wow! I must get one of these!